My first family holiday was to North Devon when I was three years old. It was 1967 and my Dad drove my Mum, me, my baby brother and my grandparents from Hove all the way down to Devon in a blue VW Dormobile. Apparently we did cool things before we even knew they were cool! We stayed in a caravan at Woolacombe Sands and spent our days on the wide sandy beach. I remember my Grandad bringing me a crab he’d caught in a bucket and being absolutely terrified of it. We had donkey rides and ice creams, played in the sea and built sandcastles. Happy days. In April I went back to North Devon for another family holiday. Mr Jones, my son, his girlfriend and their four-month baby Jack came too. This time I was the grandparent! 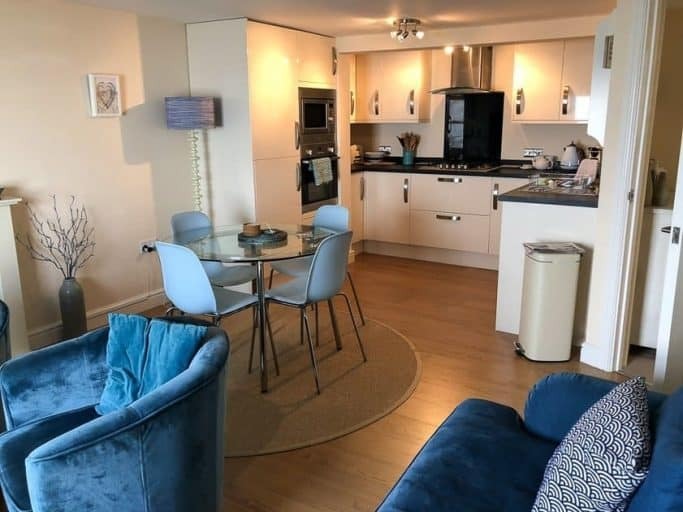 What goes around eh… Our base for the week was Horizons in Ilfracombe, North Devon, a modern, seaside themed apartment overlooking the town’s pretty harbour. 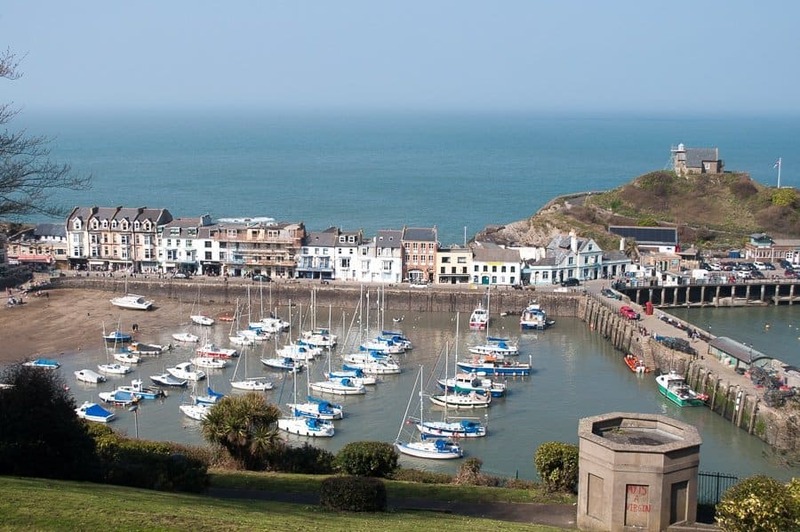 Ilfracombe is a quaint Devon seaside harbour town known locally for its ‘curious coastal charm’ and likened to St Ives in Cornwall. Colourful buildings, shops, galleries, restaurants and pubs line the ancient quayside and the alleyways of the old town. 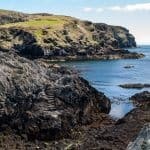 There’s a choice of sandy bays, beaches and craggy coastal walks. Views over the town from Lantern Hill are worth the climb and Capstone is the perfect place to catch a sunset. 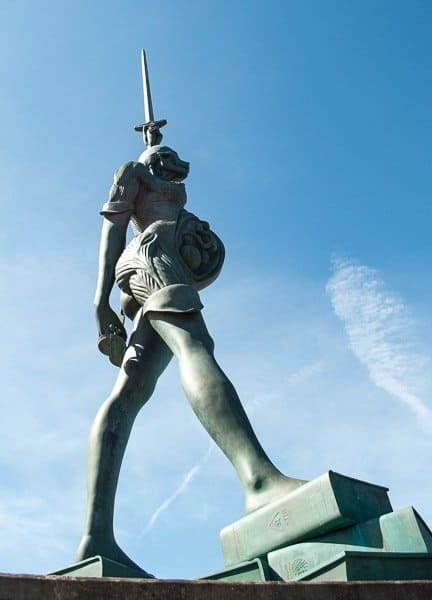 You’ll love or loathe Verity the 20m high Damien Hirst statue that welcomes vessels into the harbour. If you like seafood you’ll enjoy it pretty much straight from the boat in S&P’s seafood shop by the lifeboat. 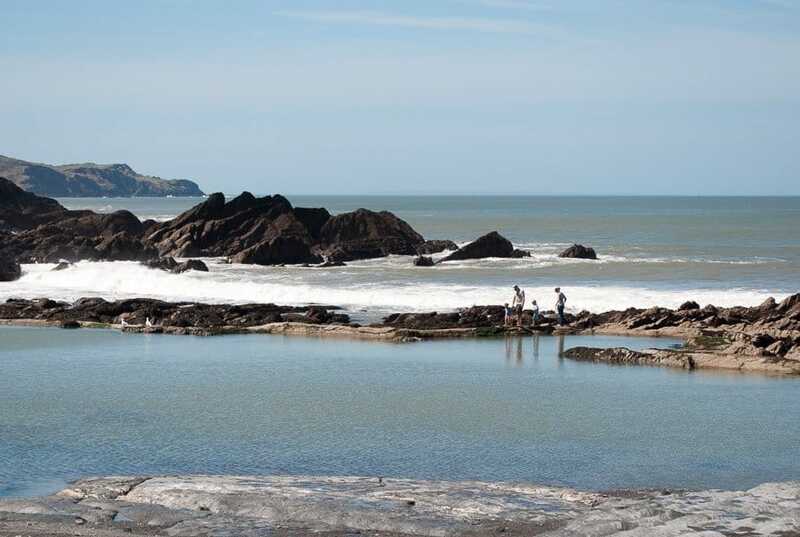 The town is also home to the Landmark Theatre, Ilfracombe Aquarium and the famous Tunnels Beaches with its sheltered bathing pool. 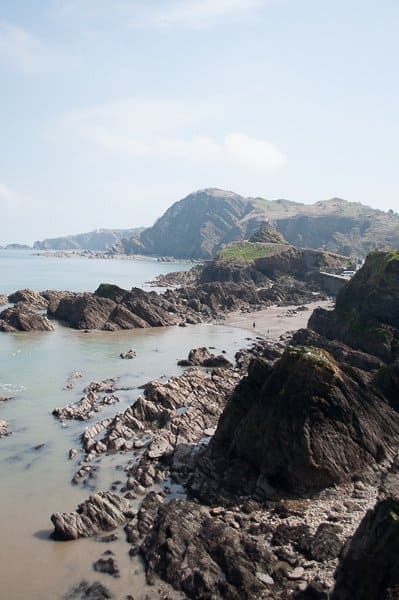 An hour’s walk will take you along some stunning coastline and over the hills to Hele Bay where you can enjoy a Devon cream tea at the Mill House. 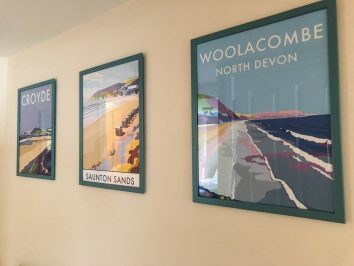 A bit further afield is Combe Martin, Woolacombe Bay, Croyde Beach for surfing and the pretty pedestrian village of Clovelly. 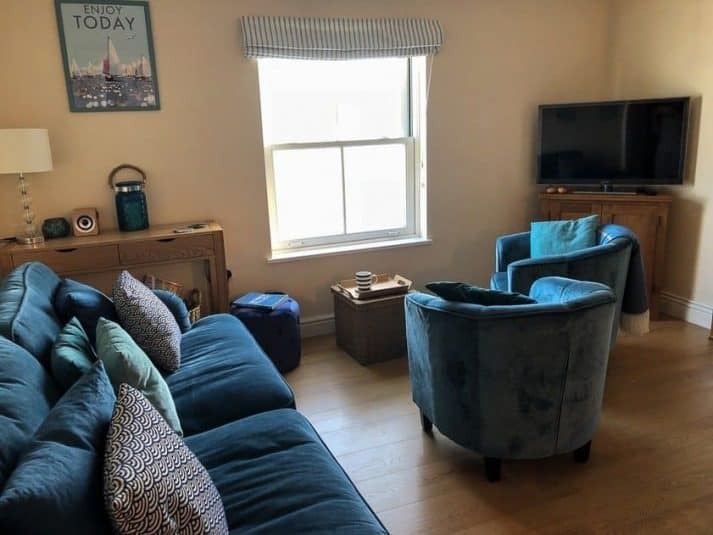 Our Ilfracombe holiday accommodation was a Marsdens Cottages apartment located in a Grade II listed Georgian terrace. 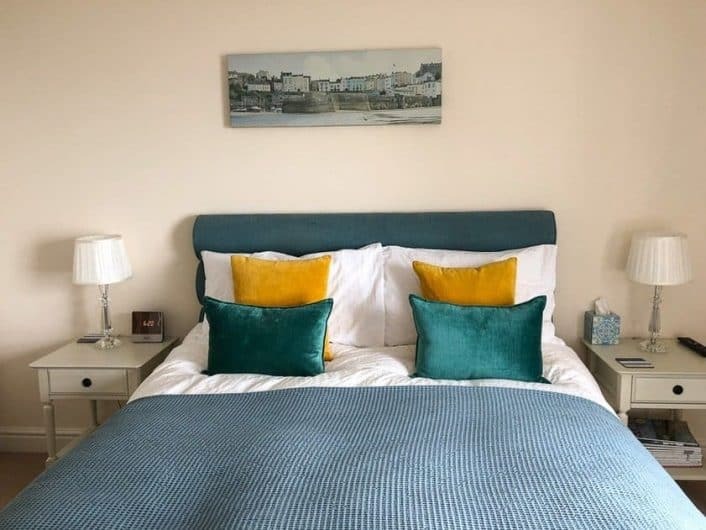 Horizons couldn’t have been more aptly named – we loved the gorgeous views looking directly over Ilfracombe Harbour, the craggy North Devon coastline and views out to sea. On a clear day you can see right across the Bristol Channel to the Welsh coastline. As soon as we arrived we were drawn to the window and those fabulous harbour views. 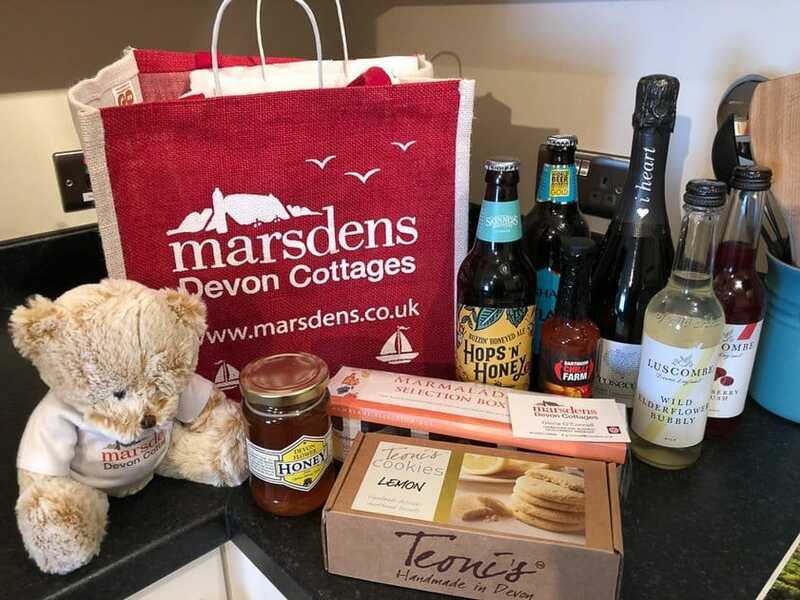 Then we noticed the table all set up for tea and a hamper packed full of locally produced goodies; marmalades, honey, cookies, craft beers, bubbles, soft drinks, chocolates and even a Marsden’s teddy bear for Jack. The wonderful welcome helped us feel very much at home. The living area is an open plan sitting room, dining area and kitchen and is light and airy and beautifully decorated. There’s a seaside theme throughout which we loved and gave a real sense of being by the ocean. The sitting room has a flat screen TV with Freeview, DVD player and WiFi. A big sofa, armchairs and a table and chairs made for a comfy time. 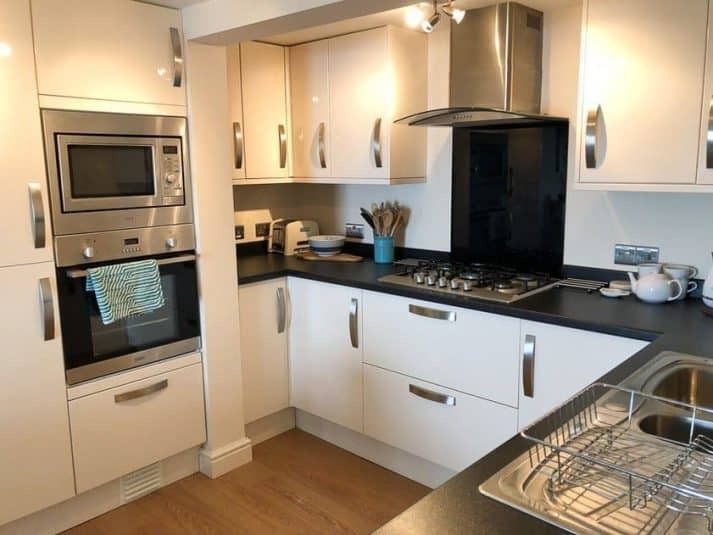 The modern, high quality kitchen had everything we needed including an oven, hob, microwave, dishwasher and fridge-freezer. There’s also a washing machine and tumble dryer in one of the hall cupboards. Horizons is incredibly thoughtful when it comes to stocking the kitchen. There were store cupboard basics like tea, coffee and sugar, including a Nespresso machine. Sauces and olive oil were provided together with condiments. There were cleaning products, foil, cling film, dishwasher tablets and loo rolls. Everything you could possibly need was provided. All we needed to shop for was our food. 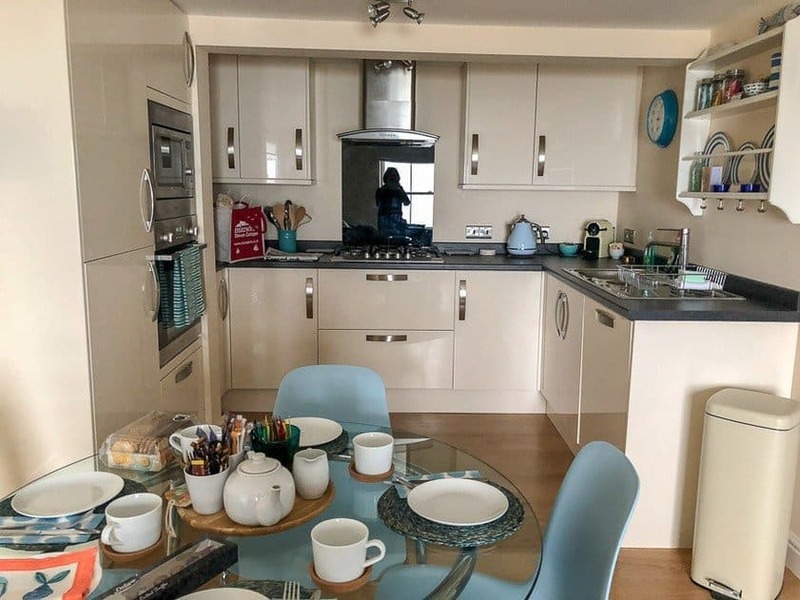 There’s a small Co-op a few minutes’ walk away in the town, a large Tesco just a ten minutes’ drive away and lots of places to eat out in the town from pub grub to fish and chip restaurants to the Michelin starred Olive Room Restaurant. The master bedroom, at the front of the property, enjoys the same stunning outlook across the harbour as the sitting room. 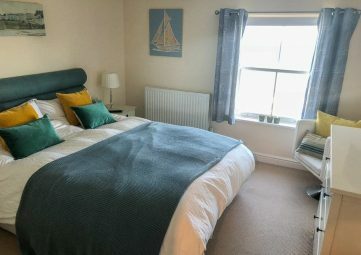 There’s a very comfortable king-sized bed and plenty of room for clothes with a double wardrobe, chest of drawers, dressing table and a chair by the window for enjoying the views. There’s a flat screen TV, soft, fluffy towels, a hairdryer and a sewing kit for wardrobe malfunctions. There was even room fragrance spray – the devil’s in the detail at Horizons. The second bedroom at the back of the house has twin beds, a wardrobe and chest of drawers. We took our own travel cot as this isn’t provided. 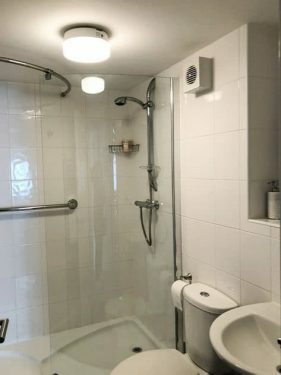 The family bathroom has a powerful shower in a double walk-in cubicle and a loo and hand-basin. Toiletries were also provided. The apartment has a shared entrance, with stairs to the top floor. We didn’t have a problem with the four flights as the stairs are quite shallow. It was worth the climb for the views from the top of the building and it helped burn off a pasty or two. 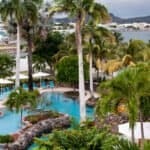 A dedicated parking space is located right outside the property so parking was convenient and never an issue. 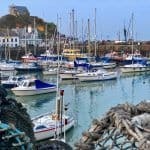 A local paper had been left for us along with a handy file filled with tips on what to see and do in Ilfracombe with info on walks, activities and the best places to eat. Comprehensive information on everything we might need for the apartment and appliances was neatly filed, in fact everything we could possibly have needed to know had been thoughtfully provided. 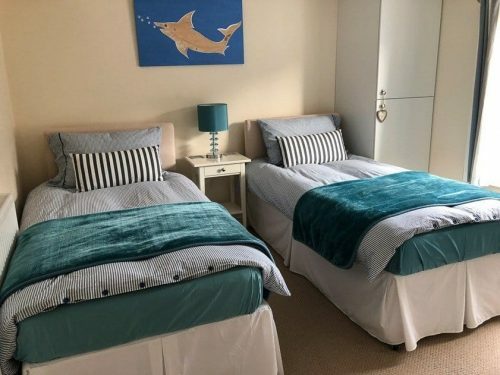 Horizons in Ilfracombe was the perfect base for our first family holiday with Jack and we made some precious family memories. 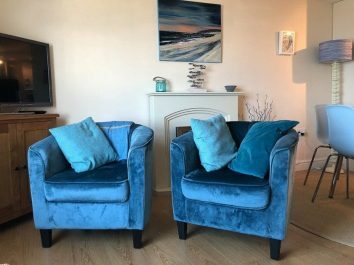 The beautifully decorated apartment is impeccable and fully equipped for a family self-catering holiday. 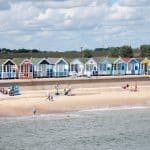 It’s less than ten minutes’ walk from the lively harbour with its restaurants, pubs, bars and coffee shops. If you didn’t want to cook you wouldn’t need to. 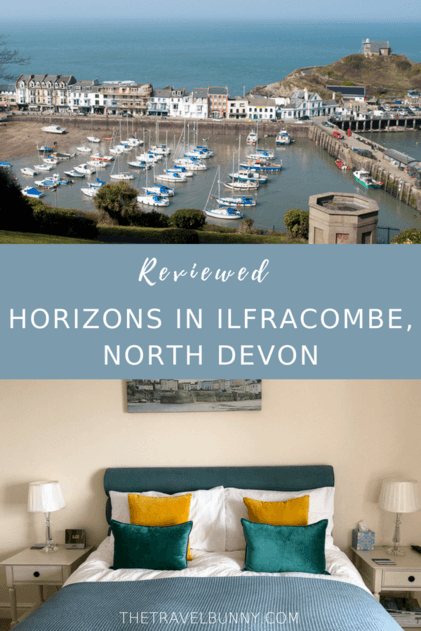 Ilfracombe, with its beautiful beaches and coastal walks kept us busy and entertained and we could easily have stayed longer. We loved our stay at Horizons. Marsdens Devon Cottages is an independent family business which started in 1973. 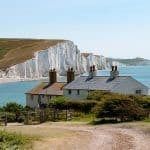 It has over 350 holiday properties to rent in Devon from romantic cottages for two, celebration properties, dog-friendly cottages and cottages for large groups. A week’s stay (Friday–Friday) for four people at Horizons starts from £315. Lower prices for 2 people staying. Short breaks are available (minimum 3 nights) from September to June. Many thanks to Marsdens Devon Cottages who kindly hosted us. All views and opinions are, as always, entirely my own. North Devon is a real charmer. 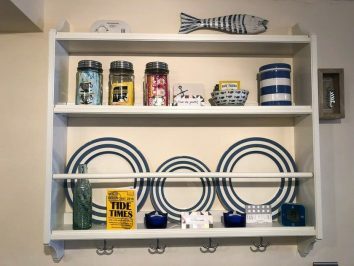 I adore the way the cottage brought in the colors of the sea inside in so many different ways. 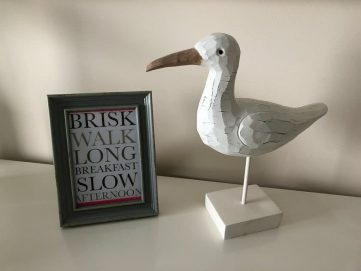 What a pleasing decor! It was like being at the seaside both outdoors and in! The property was the perfect base for a family holiday. 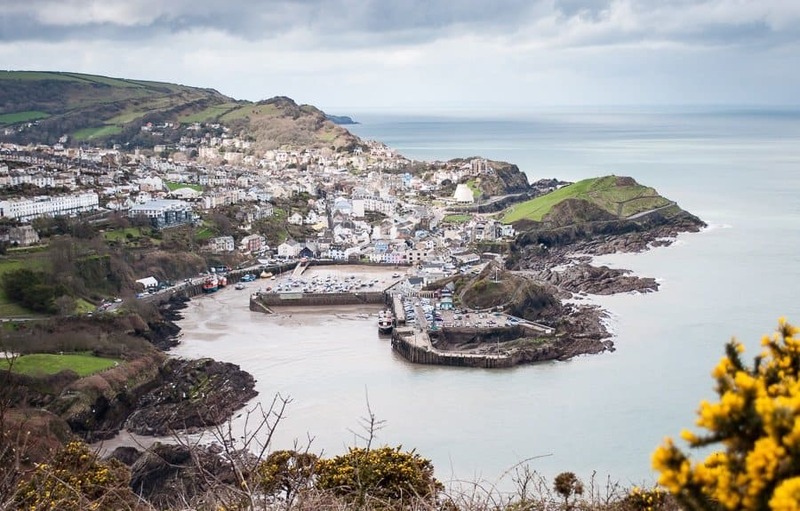 I did a lot of holidays to North Devon when I was a kid but don’t think I’ve ever been to Ilfracombe – one for the list though as it looks lovely. And Horizons looks beautful – those views are stunning! 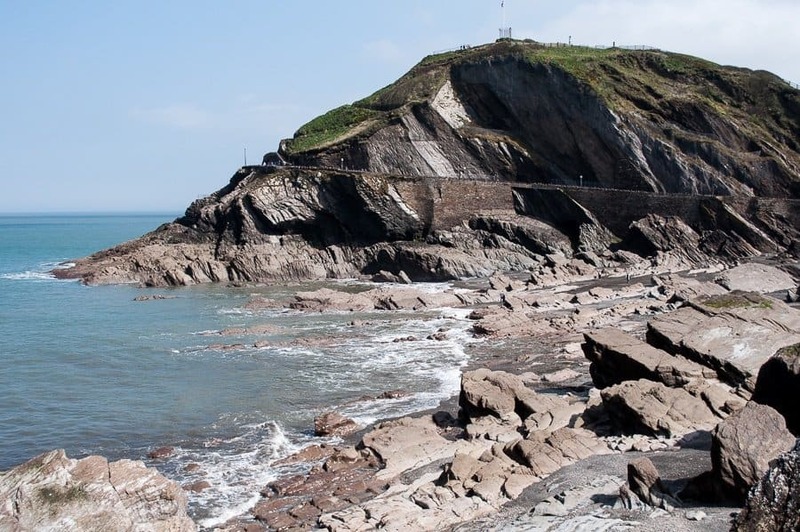 Horizons was spot on for our Ilfracombe break and those views were the icing on the cake! 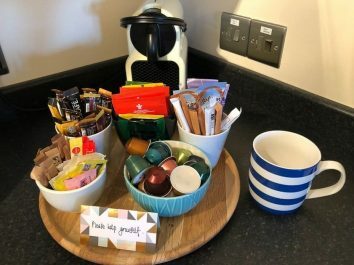 Love your apartment and that hamper looks like the perfect welcome. Mind you, I’d have wanted to keep the teddy bear for me!! It was the perfect place for our first family holiday together. The teddy is Jack’s first holiday memento! Sounds like a lovely place to stay. 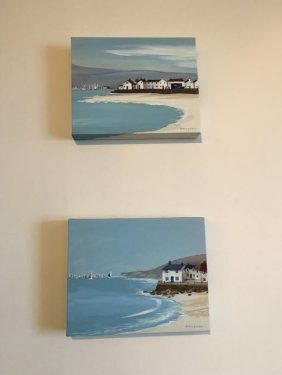 And you are making me want to visit North Devon, I’ve only been to South before and really loved it. I’d forgotten how gorgeous North Devon is, should have gone back years ago! I’m glad I’ve inspired you to visit. It was gorgeous Jo – my favourite kind of place. Yes, we had weather – lots of different types! I sent away the comment before I had finished. Not use my tablet yet. The cottage looks fantastic too. Love the coloration. In Porto now and the little apartment is fantastic. Old building in Sé and it has lift. 5 min to the Ribeira, downhill!!!! But it’s wet today. 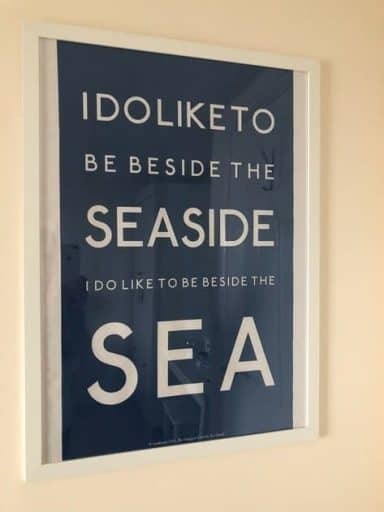 But I just LooOoove to be . Just stunning. I have only passed through Devon on my way to Cornwall. I love the decor, it’s the perfect combination of stylish and quaint but also functional – totally coveting those posters for myself!